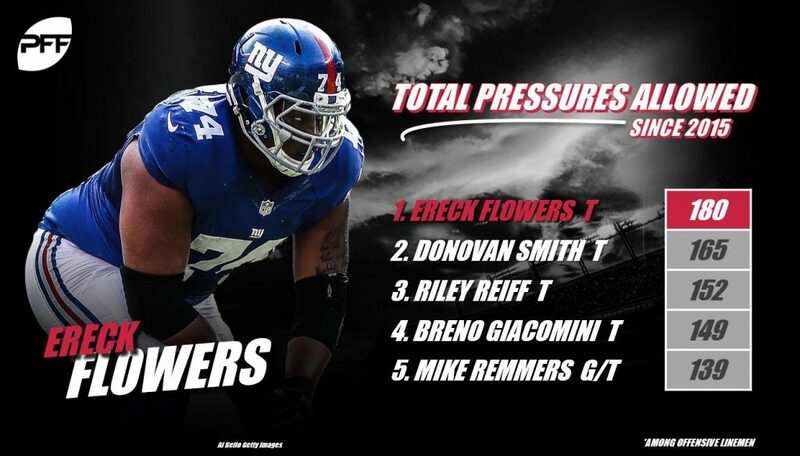 The Ereck Flowers experiment is coming to a long-awaited end in the Big Apple. Per ESPN’s Adam Schefter, Flowers will be released if he isn’t traded by 4:00 p.m. ET on Tuesday. The 24-year-old offensive tackle, regardless of the other 31 NFL teams’ interest, will see his 51-game, 3,225-snap tenure with the New York Giants come to a close soon enough. Flowers’ efforts in New York, to put it simply, were bad – historically bad. Among the 275 offensive linemen with at least 1,800 pass-block snaps in the PFF era (2006-Present), Flowers ranks dead last in pressure percentage allowed (9.45%) and 273rd in pass-blocking efficiency (94.8). The former Miami (Fla.) product allowed 180 total pressures, including 130 hurries, 34 hits and 16 sacks, across his 1,911 (regular season) pass-block snaps with the Giants. His 61.8 career pass-block grade ranks 271st among the same group of offensive linemen, as well. His run blocking, though better than his play in pass protection, didn’t save Flowers from criticism, either. He ranked 58th among 74 qualifiers in run-block grade (52.8) in 2017, and through 41 run-block snaps in 2018, he had accrued just 55.6 run-block grade. Flowers’ pending release/trade is a step in the right direction in terms of correcting the issues along the Giants’ offensive line, but the immediate future isn’t much brighter. Second-year offensive tackle Chad Wheeler, who stepped in for Flowers at right tackle in Week 3, has earned just a 51.9 overall grade across his 183 offensive snaps in 2018, ranking 66th among 73 qualifiers. Making matters worse, his run-block grade (43.2) ranks 69th among the same group of tackles, and he ranks 60th among the 63 tackles with 100-plus pass-block snaps in pass-blocking efficiency (93.2). The former undrafted USC product has allowed 13 total pressures (10 hurries, three sacks) across his 117 pass-block snaps so far this season. Starting in the 2013 NFL Draft, New York’s brass selected three offensive linemen with one of their top-50 picks in three consecutive drafts – Flowers was (supposed to be) the final piece of the puzzle. After spending significant draft capital on Weston Richburg (2014) and Justin Pugh (2013), the Giants opted for Flowers with the ninth overall selection of the 2015 NFL Draft. Now, in less than 24 hours, all three big men will be off the team’s 53-man roster, and New York will likely be looking for another one in the draft come May.